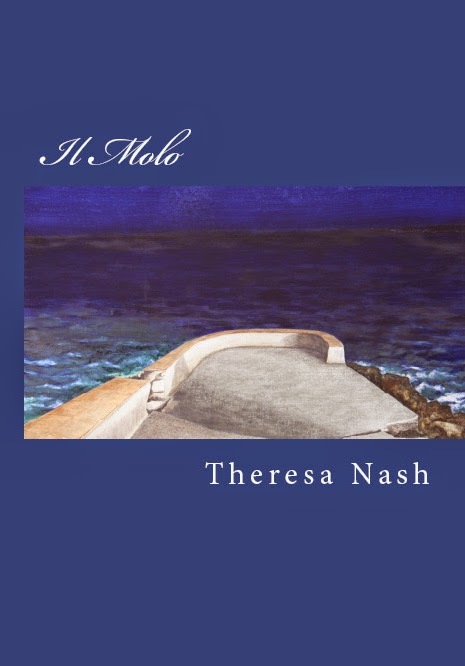 Welcome to Theresa Nash, who was born in Waterloo, Iowa, the second child in a family of seven children. Her father was a well-known doctor and her mother was active in community organizations. She a BA in Economics and an MBA in Finance. In 1975, she moved to Geneva, Switzerland, and have been here ever since. Her professional career has always been in finance, but she also has a very artistic side. She plays the violin in an orchestra, has sung in many choirs and solo, acted in plays and musicals, and now has entered into the world of writing. Her husband is a famous Swiss artist (thus the cover of her book), and her daughter is currently pursuing a master's degree in marketing and management. Il Molo takes place in a real village in Italy, Varigotti, where we go at least for one week for summer vacation. Martha, the main character, struggles with a universal problem – loving more than one man at the same time and realizing that you can have more than one soul mate. The characters are based partially on real people. My friends figured this out right away! How do you find time to write and do a demanding job? It’s not easy. Plus I have a blog and I’m the administrator for a website for indie authors – Literary Selfies – www.literaryselfies.com. But somehow I manage to fit it all in. The one thing that helps is that I think about the storyline all the time, and when I can I sneak in a chapter or two. What inspired your latest book? The topography of Varigotti and the surrounding area lends itself to a crime, my love of crime novels and thrillers, and (don’t want to give too much away) the fact that I dream all the time. How much fact is in your fiction? The only reality is Varigotti, its history and the pier - Il Molo. I know that I identify easier with a story if it’s set in a real place. That’s probably why I am not into science fiction. But I have to admit that I do love magic and I loved the Harry Potter books where almost everything was imaginary. What makes your book/characters unique? The setting of the story - I think there may be only one or two novels set place in Varigotti, and these are in Italian. The characters are unique because they are based on people that I know have never appeared in a novel. IL MOLO -- Set on the Ligurian seacoast in western Italy, IL MOLO craftily blends intrigue, illusion, reality and love. Martha and her husband, Carl, are on their annual summer vacation in the picturesque village of Varigotti, Italy. She soon learns that even in their summer paradise the past can intrude on the present and threaten the future. Interesting ingredients! I have to ask though - if your friends recognise the characters then so must the people you've based them on. Don't they mind? Did you show them the book before publishing? No they don't mind. Some of the characters are a composites of people I know. And the most important ones read the book before it was published.